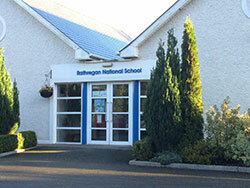 The school is located on the RI54 Dunboyne to Trim road, approximately 9.5 kilometres from Dunboyne. From Dublin, take the M3 Junction 5 and follow the signs to Trim. Rathregan NS is on the right hand side just before The Village Pump / Centra petrol station.